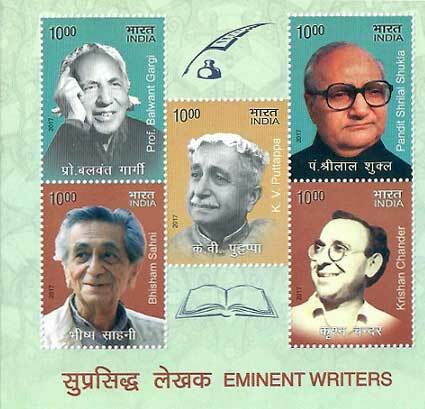 Commemorative Stamps on Eminent Writers K. V. Puttappa, Krishan Chander, Srilal Sukla, Balwant Gargi and Bhisham Sahni – 31st May 2017. Kuppali Venkatappa Puttappa (b. 29 December 1904 - d. 11 November 1994), popularly known by the nickname Kuvempu or by K. V. Puttappa, was a Kannada novelist, poet, playwright, critic and thinker. He is widely regarded as the greatest Kannada poet of the 20th century. He is the first among Kannada writers to be decorated with the prestigious Jnanpith Award. He was conferred the Padma Vibhushan by Government of India in 1988. He penned the Karnataka State anthem Jaya Bharata Jananiya Tanujate. Krishan Chander (b. 23 November 1914 - b. 8 March 1977) was an Urdu/Hindi writer of short stories and novels. He also worked on English. He was a prolific writer, penning over 20 novels, 30 collections of short stories and scores of radio plays in Urdu and later, after partition of the country, took to writing mainly in Hindi. He also wrote screen-plays for Bollywood movies to supplement his meagre income as an author of satirical stories. His short story "Annadata" was made into the film Dharti Ke Lal, by Khwaja Ahmad Abbas in 1946 – which led to his being offered work regularly as a screenwriter by Bollywood, including such populist hits as Sharafat 1970. Pandit Shrilal Shukla (b. 31 December 1925 - d. 28 October 2011) was a Hindi writer, notable for his satire. He worked as a Provincial Civil Services (PCS) officer for the state government of Uttar Pradesh, later inducted into the IAS. He has written over 25 books, including Raag Darbari, Makaan, Sooni Ghaati Ka Sooraj, Pehla Padaav and Bisrampur Ka Sant. Shukla has highlighted the falling moral values in the Indian society in the post-independence era through his novels. His writings expose the negative aspects of life in rural and urban India in a satirical manner. His best-known work Raag Darbari has been translated into English and 15 Indian languages. Balwant Gargi (b. 4 December 1916 – d. 22 April 2003) was a renowned Punjabi language dramatist, theatre director, novelist, and short story writer, and academic. Gargi wrote several plays, including Loha Kutt, Kesro, Kanak Di Balli, Sohni Mahiwal, Sultan Razia, Soukan, Mirza Sahiba and Dhooni di Agg and short stories Mircha Wala Sadh, Pattan di Berhi and Kuari Disi. His plays were translated into 12 languages, and have been performed around the world, including Moscow, London, New Delhi and around the United States. Bhisham Sahni (b. 8 August 1915 - d. 11 July 2003) was a Hindi writer, playwright, and actor, most famous for his novel and television screenplay Tamas ("Darkness, Ignorance"), a powerful and passionate account of the Partition of India. He was awarded the Padma Bhushan for literature in 1998 and Sahitya Akademi Fellowship in 2002. He was the younger brother of the noted Hindi film actor, Balraj Sahni. Actor and Lok Sabha member Kirron Kher released stamp on Balwant Gargi on 31st May 2017 at the Panjab University English department auditorium, Chandigarh, the same place where she made her theatre debut in 1971 with ‘Desire Under the Elms’ directed by Balwant Gargi. Stamps on other four Eminent Writers K. V. Puttappa, Krishan Chander, Pandit Srilal Sukla and Bhisham Sahni were also released by her. Three writers out of the five, Balwant Gargi, Bhisham Sahni and Krishan Chander, were from Panjab University. All stamps are in denomination of Rs. 10 each and Miniature Sheet is in denomination of Rs. 50. Special Cover on Biddatanda Hockey Namme - 2017 (21st Kodava Hockey Namme) – 12th May 2017. The Biddatanda Family, a pre-eminent clan of Kodavas is based at Napoklu (Nalnad) from time immemorial. It is said that the Biddatanda Chieftains ruled parts of Kodagu at a time now lost to recorded history. The Biddatanda clan now numbers just over 120 persons. Some of its members have held and several continue to hold prominent offices in various Government services and public fields. Pandanda Kuttappa, a resident of Krada village aimed at reviving Hockey in the district after noticing the exodus of youth to cities. The annual hockey event has become a common feature in the small district known as "Southern Punjab" for sports where the competition turns to a fest. Around 60 teams took part in the first edition of the tournament in 1997. The 21st edition of Kodava family based hockey tournament for the prestigious Biddatanda Cup was inaugurated on 17th April 2017 at the General Thimmaiah Hockey Stadium, where more than 300 teams took part. Every Kodava family has contributed in a way or the other towards the tournament's success with the onus on Biddatanda family. The tournament was held from 17th April 2017 to 14th May 2017. 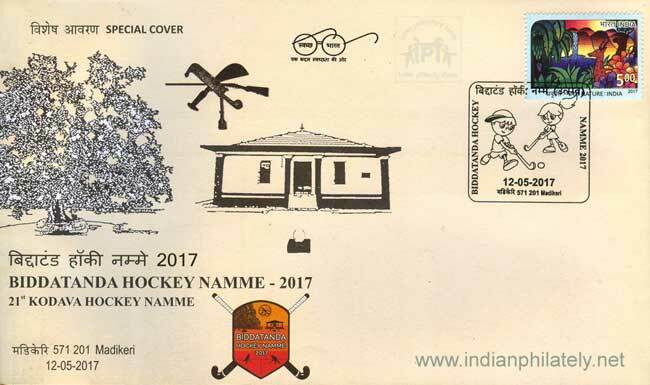 A Special Cover was released to commemorate the 21st Hockey Namme (Festival) on 12th May 2017 at Madikeri (Special Cover approval no. KTK/50/2017). Commemorative Stamp on Shri Hangal Kumara Swamiji – 19th May 2017. Shri Hangal Kumara Swamiji was religious head and Guru of many of the heads of various Lingayat matts in Karnataka. Swamiji founded Shivayoga Mandir and Akhila Bharata Veerashaiva Mahasabha. He motivated the establishment of educational societies and conservation of Vachanas besides promoting Yoga. 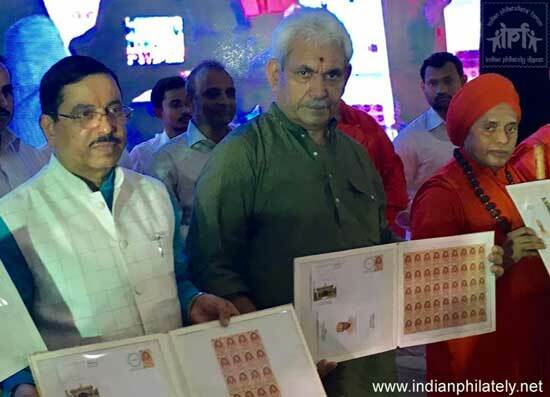 As a part of 150th birth anniversary celebration of Shri Hangal Kumara Swamiji a commemorative stamp was released by Union Minister of State for Communications Manoj Sinha on 19th May 2017 at HDMC Samskritika Bhavana, New Cotton Market in Hubballi. 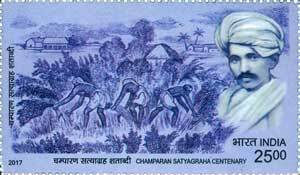 Commemorative Stamp on Champaran Satyagraha Centenary - 13th May 2017. 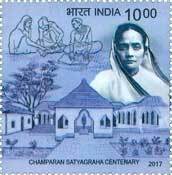 A year-round celebration in commemoration of 100 years of Champaran Satyagrah began on 10th April 2017 with a National Conclave or Rashtritya Vimarsh where eminent Gandhian thinkers, philosophers and scholars participated in Bihar. 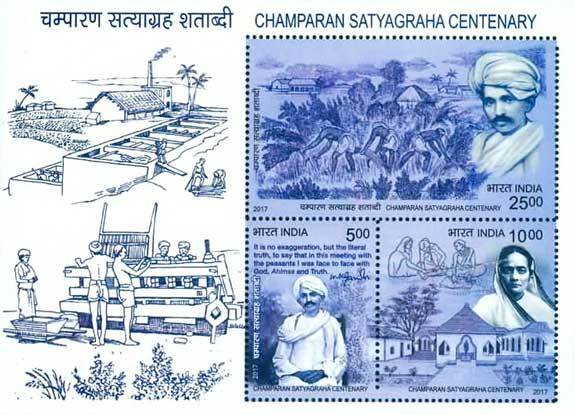 To commemorate Champaran Satyagraha Centenary a set of three commemorative stamps in denomination of Rs. 5,10 and 25 and a Miniature Sheet in denomination of Rs. 40 were released on 13th May 2017 by Shri Manoj Sinha, Minister of State for Communication (Independent Charge) and Minister of State for Railways. Special Cover on Family Welfare Training & Research Centre (FWTRC), Mumbai – 5th May 2017. Family Welfare Training & Research Centre, (FWT&RC) Mumbai, was the first Family Planning Training Centre, established in June 1957 under Union Ministry of Health and Family Welfare at "Parekh Hospital" Building, 332, S.V.P. Road, Khetwadi, Mumbai - 4. It is one of the Central Training Institutes (C.T.I.) conducting in-service training for Medical and Paramedical personnel in key health areas to enhance their knowledge and skills for better delivery of health care services. These training are for the Central, State and District level health personnel from all over the country. The Centre is identified as a collaborating Institute for certain specialized training like Immunization, Communication, etc. Under the WHO fellowship programme for South-East Asian Region, FWT&RC has been identified as one of the Collaborating Institute. Fellows from Srilanka and Bangladesh are deputed for programmes in Gender Issues, Safe - Motherhood, Maternal and Foetal Nutrition, Management Information System and RCH. On the Occasion of Diamond Jubilee Celebration of the Family Welfare Training & Research Centre (FWTRC), Mumbai (1957-2017) a Special Cover was released at Mumbai on 5th May 2017 (Special Cover approval no. MH/11/2017). 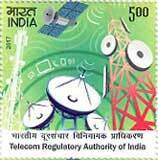 Commemorative Stamp on The Telecom Regulatory Authority of India (TRAI) – 5th May 2017. Telecom Regulatory authority of India (TRAI) was established on 20th February 1997 by an Act of Parliament to regulate telecom services, including fixation/revision of tariffs for telecom services which were earlier vested in the Central Government. TRAI's mission is to create and nurture conditions for growth of telecommunications in the country in a manner and at a pace which will enable India to play a leading role in emerging global information society. One of the main objectives of TRAI is to provide a fair and transparent policy environment which promotes a level playing field and facilitates fair competition. In pursuance of above objective TRAI has issued from time to time a large number of regulations, orders and directives to deal with issues coming before it and provided the required direction to the evolution of Indian telecom market from a Government owned monopoly to a multi operator multi service open competitive market. TRAI has contributed to growth of Telecom & Broadcasting while ensuring consumer protection and fair play in the sectors. On the occasion of its completion of 20 glorious years two-day Seminar on 'Digital Broadcasting in India: Way Forward' was organized by TRAI. 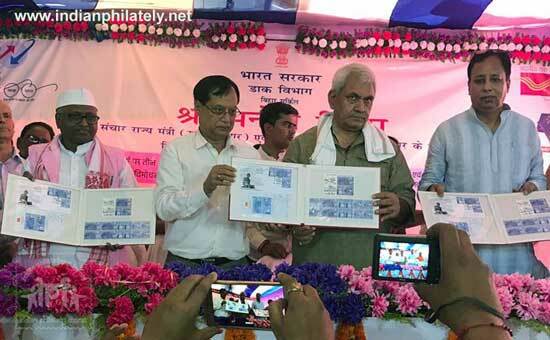 The Minister of State for Communications (Independent Charge) and Railways, Shri Manoj Sinha released a Commemorative Stamp on The Telecom Regulatory Authority of India (TRAI) in presence of Minister of State for Information & Broadcasting, Col. Rajyavardhan Singh Rathore, The Chairman, TRAI, Shri R.S. Sharma, Secretary, Department of Posts & Chairperson, Postal Services Board, Shri Ananta Narayan Nanda at the closing ceremony of the two-day Seminar on Digital Broadcasting in India – Way forward in New Delhi on 5th May 2017. Commemorative Stamp on Saint Ramanujacharya – 1st May 2017. Ramanuja (Ramanujacharya) was a Hindu theologian, philosopher, and one of the most important exponents of the Sri Vaishnavism tradition within Hinduism. He was born in the year 1017 A.D., in the village of Perumbudur, about twenty-five miles west of Madras (Chennai). His father was Kesava Somayaji and his mother was Kantimathi, a very pious and virtuous lady. Ramanuja's Tamil name was Ilaya Perumal. Quite early in life, Ramanuja lost his father. Then he came to Kancheepuram to prosecute his study of the Vedas under one Yadavaprakasha, a teacher of Advaita philosophy. Ramanuja's guru was Yadava Prakasa, a scholar who was a part of the more ancient Advaita Vedanta monastic tradition. Yadava Prakasha's interpretations of Vedic texts were not quite up to his satisfaction. Ramanuja is famous as the chief proponent of Vishishtadvaita subschool of Vedanta and his disciples were likely authors of texts such as the Shatyayaniya Upanishad. Ramanuja himself wrote influential texts, such as bhasya on the Brahma Sutras and the Bhagavad Gita, all in Sanskrit. His philosophical foundations for devotionalism were influential to the Bhakti movement. When caste distinction and hierarchy had been recognized as integral to society and religion and everyone had accepted her place as high and low in the hierarchy, Saint Shri Ramanujacharya rebelled against it - In his personal life and religious teachings. 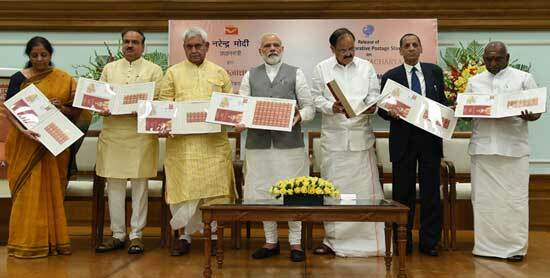 A Commemorative Stamp was released on the occasion of the one thousandth birth anniversary of the great social reformer and Saint Shri Ramanujacharya by Prime Minister of India, Shri Narendra Modi in New Delhi on 1st May, 2017. The Governor of Telangana and Andhra Pradesh, Shri E.S.L. Narasimhan, the Union Minister for Urban Development, Housing & Urban Poverty Alleviation and Information & Broadcasting, Shri M. Venkaiah Naidu, the Union Minister for Chemicals & Fertilizers and Parliamentary Affairs, Shri Ananth Kumar, the Minister of State for Communications and Railways, Shri Manoj Sinha, the Minister of State for Commerce & Industry, Smt. Nirmala Sitharaman and the Minister of State for Road Transport & Highways and Shipping, Shri P. Radhakrishnan were present on the occasion.